Tom Hardy (Mad Max: Fury Road) and Michelle Williams (My Week with Marilyn). They’re a great pairing. Hardy is always fun to watch and Williams is an A-list talent who always brings credibility to her roles. As Venom opens — well, after a 100% standard comic book scenario-setting opening sequence involving a crashed spaceship and an alien symbiote — Hardy and Williams are introduced. The story moves along at a pleasant pace as their characters are revealed. Hardy is Eddie Brock, a top-notch investigative journalist in the Bay Area. Okay. Top-notch to some. His editor describes him as a smart guy who’s a dumbass. Eddie does have a bit of a fetish for ferreting out the seamy side of his stories and plenty of his targets find him a smidge abrasive. As for Williams, she’s Anne Weying, Eddie’s fiancé and a strong-arm attorney pursuing a wrongful death case against The Life Foundation, run by a mega-rich visionary genius along the lines of Elon Musk, Steve Jobs and Tony Stark. That’d be Carlton Drake (Riz Ahmed, Rogue One: A Star Wars Story). This is when Venom’s really pretty good. The characters are interesting and it’s a setup for a decent drama as Eddie falls from grace. His aggressive approach to investigations and his flagrant disregard for following the agenda for an interview with Carlton gets him fired. Then he loses his fiancé and his apartment. But then he meets the symbiote, bushels of CGI effects kick in and — counter-intuitively — the movie loses its edge. Some say the Life Foundation is creating an empire built on dead bodies; it’s an organization that should be renamed the Death Foundation as it subjects live human “volunteers” to this alien symbiote in hopes of creating a whole new strain of life. As Eddie investigates the foundation, fate enters the picture and a symbiote enters Eddie’s system, empowering him to scale tall buildings and exterminate people with aplomb. Fortunately, Eddie absorbs a symbiote with some sort of a conscience. Even as Eddie has turned into a loser on Earth, so, too, is his symbiote considered a loser back on its home planet. And that symbiote, called Venom, is in conflict with Riot, a symbiote Carlton has apparently — actually, inexplicably — learned to control, or at least coexist. There is the potential to go dark and subversive with this material, something akin to Deadpool, another Marvel property. But things are kept strictly PG-13 here and the movie suffers for it. There simply isn’t enough to set this collection of mayhem apart from all of the other collections of mayhem piling up on screens as both Marvel and DC press forward with expanding their cinematic universes. For what it’s worth, Venom as presented here is a big upgrade from what Sam Raimi did in Spider-Man 3, with Topher Grace in the Eddie Brock role. It’s all machinery now, though. 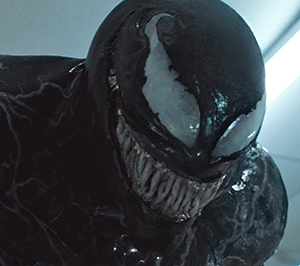 Venom is merely a product and, following standard production standards these days, it includes a tease of the next chapter shortly after the end credits begin to roll. This tease involves a kook named Cletus Kasady (Woody Harrelson, Solo: A Star Wars Story). It’s the kind of character introduction that gets the comic book kids all kinds of giddy while leaving the rest of the universe out in the cold. In a nutshell, Cletus is a psychopathic serial killer who goes on to market himself as Carnage in the world of super-villains. Maybe that sequel will happen. Maybe it won’t. It’ll all depend on the box office returns of this endeavor. But it all ends on a rather depressing note. There’s another tease, toward the end of the end credits (the really long end credits). It’s an extended peek at Spider-Man: Into the Spider-Verse, an animated revisionist take on the Spider-Man story in which a multiplicity of Spideys from alternate universes unite to save... um... the universe. Sure, Spider-Man and Venom are related characters. But this late-credits move feels like a cheap ploy, nothing more than a commercial that is completely dissonant with the tone of everything that preceded it.